Many say "a nurse is a nurse" but that's not always the case. There is different designation and licensing for RNs and LPNs. And facilities often advertise "LPN openings" - but if a nurse is a nurse, why would they ever advertise for just LPNs? Wouldn't it just be a nursing job which either an LPN or RN could fill? And then other positions would be RN-only. Unless an RN has been an LPN, it IS confusing to RNs what LPNs are and aren't legally qualified to do and why they aren't legally qualified to do certain things yet often function in an almost identical role RNs (eg only can't do initial assessments and hang blood in acute care). We all know that many LPNs have great assessment skills and technical skills and critical thinking skills. A patient wouldn't recognize any difference between a good LPN and a good RN. In that case, "a nurse is a nurse." But then what more exactly did the RN learn in their program to allow them to qualify for significantly more pay than LPNs in most facilities? Why ISN'T an LPN allowed to do an initial assessment or hang blood? It wouldn't take that much extra formal training to bring them formally up to speed on these tasks and include that in their scope of practice. So what more does the RN education have to offer in regard to actually practicing nursing in most settings? Just subscribing to this thread, very interested to see the answers, opinions,etc to your interesting questions...not a nurse yet so the only thing I would be able to contribute are guesses...my only questions to the OP is when you say facilites are you only referring to hospitals or are you also including nursing homes, home health, etc? To everyone else, I am interested in what kind of classes are the LPNs missing that prevent them from being able to do the initial assessments in hospitals? The scope of practice for both RN's and LVN's is determined by the state in which they practice. LVN's do not receive the same level of education as RN's. The pharmacology and math even differs. In my state the RN must do the initial full assessment, design the plan of care (including teaching) and may start IV's. The LVN does a focused assessment, carries out the plan of care and needs certification from their employer before starting IV's (or whatever the facility policy calls for). On the floor the LVN and RN may have similar duties, but the RN has more responsibility. Until I got the extra education I did not see the difference either, but believe me, there is plenty of difference in the education and in expectations. ohmeowzer RN works as a RN. allantiques4me works as a staffnurse at a residential center for children wi. Melody48_MSNEd has 27 years experience and works as a Family Nurse Practitioner. nursemike has 12 years experience as a ASN, RN and works as a Neuro Nurse. I work with some LPNs who have much more nursing experience than I do. I joke that my "delegation" consists of asking the LPN what she wants me to do, and doing it. But our Nurse Practice Act states differently, and of course that's the law. Still, I'd be stupid if I didn't work collaboratively with these very good nurses. My workplace actually prefers RNs, and my unit especially has fairly limited openings for LPNs because a number of our beds have to be assigned to RNs. I would imagine the only reason an LPN would ever be prefered is money--at my facility, a starting RN makes almost twice what an LPN does. danielleRN76 has 9 years experience and works as a Registered Nurse. I was an LPN for 7 yrs before becoming an RN and I never really thought there was much difference until I was an RN. My education was much deeper and my critical thinking was amazingly different once an RN. I was a darn good LPN, but I was more task oriented, where as now I see the big picture, can see more of the deeper issues and underlying conditions and how they relate to the here and now of a pt's status. It's also a very legal issue, accountability and responsibilty and so on. So, for those of you who worked as LPNs and then became RNs, looking back, would you make any changes to LPN training or to the LPN role to more clearly distinguish between the two roles and responsibilities? Can you point out any specific aspects of the RN program that especially brought home the differences you now perceive? Dental Hygienist works as a Dental Hygienist/ Student. Hi. I'm just "reviving" this thread because I was about to start one that is very similar. My questions: What is the typical training of a LPN? I know it varies state to state and program to program, but is it generally 1 year, 2 years? If it is 2 years, I cannot understand why someone wouldn't just do a ADN program? Unless it is just the competativeness to get in? 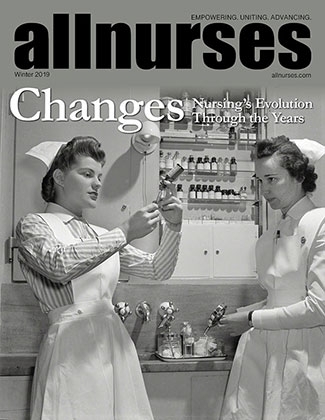 It is my understanding that LPNs make less money and must be supervised by RNs; is this true? I searched nursing jobs as part of my career research and was surprised to find that many jobs posted a starting pay for LPNs of let's say $19 an hour, but for a RN applying for the same position maybe $23 an hour....it this pretty normal that for (seemingly) the exact same position a RN would get paid more just by virtue of being a RN? Also, can LPNs work alone on a shift, or does there always have to be a RN to "supervise" them? I know it all varies state by state but I'm just looking for general information here. Thanks, and I mean no disrespect to either profession by my questions, I sincerely do not comprehend the difference other than title and pay. Ms Kylee has 4 years experience and works as a RN. My goal has always been to be an RN. However, most universities and RN programs have daylight programs and I couldn't get things to work around my schedule. The LPN program here has a part time night/weekend program, which is why I applied there. (The program stinks BTW, but that's a whole other thread). Hopefully, once I get my LPN, I'll be able to get an evening or weekend job that will allow me to get my RN.